Finding out that you have cancer can be devastating. Tina Sevaaetasi was playing at a volleyball league when she first felt the pain in her breast. Because of the excruciating pain, she was unable to continue the game and was rushed to the nearest hospital. She was in Alaska at the time when she was told that she has breast cancer. Ms. Tina has returned to her home in Pagai and continues to fly to Alaska for treatment and follow-ups. Ms. Tina hasn’t fully regained all her strength back to play volleyball again but she tries to keep herself active and is grateful for God’s blessing that keeps her alive. 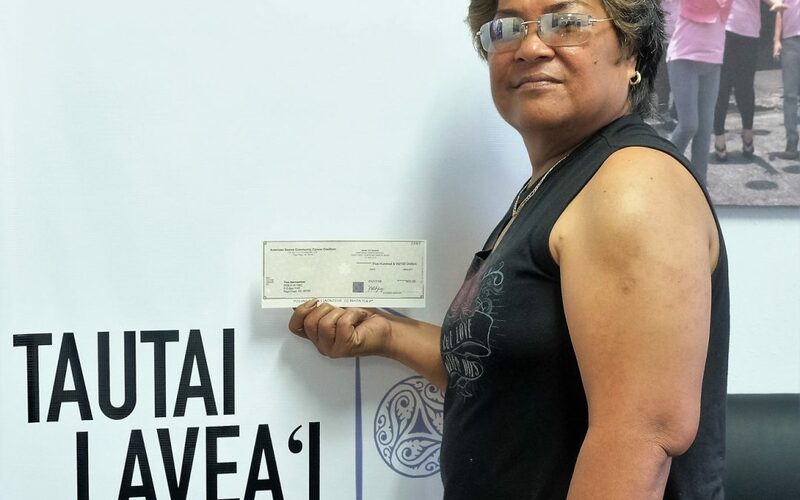 Ms. Tina Sevaaetasi accepts ASCCC cancer patient stipend of $500 with gratitude.